Bringing together Reiki and the young is a sure recipe for magic on Earth. Barbara McKell has designed a "Reiki Kids" program for the special children who will be the teachers and world leaders of tomorrow. Barbara McKell authored and published a Reiki Kids book for the children to use in the classes. She has also created a Teaching Guide for Reiki Masters and a series of Meditations for children. Below is the ordering information. 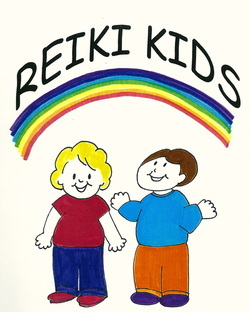 The "Reiki Kids" book is given as a guide to each child in the class. It is a simple 20 page, colouring book style manual, which the children can follow along with during the class. The book includes a simple history of Reiki, an explanation of Reiki, the energy field (chakras, aura etc), how to sense energy, the Reiki attunement and how to use Reiki. *The Reiki Kids book is now only available as part of the downloadable Teaching Bundle which includes rights to reprint the book for your Reiki Kids classes. You can order the Teaching Guide for Reiki Masters as a separate download. 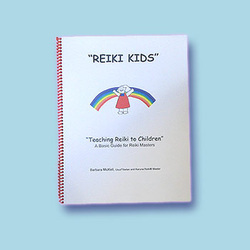 The Teaching Guide has instructions and suggestions on how to use the Reiki Kids book and how to teach Reiki to children. *Reiki Kids Teaching Guide for Reiki Masters book is also part of the downloadable Reiki Kids teaching bundle. 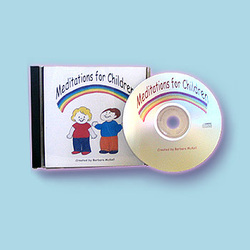 This CD is a series of four meditations to help children connect with their inner wisdom. The meditations are short and engaging. Children can visit one of these special places on a daily basis so that they may easily learn the value of regular meditation. The cost for the downloadable MP3 album is $20 Canadian. New! Reiki Kids Teaching Bundle - Includes The Teaching Guide for Reiki Masters, the Reiki Kids book. (New Revised and Expanded Version in downloadable PDF e-book format) along with a reprint license to print hard copies of the coloring book for your Reiki Kids classes. No waiting - Instant download after purchase. 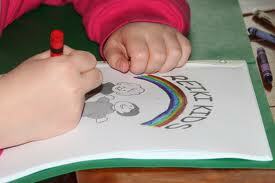 Barbara published a Reiki Kids book for the children to use in the classes. She has also created a Teaching Guide for Reiki Masters, as well as a Meditations for Children audio program. *At this time Reiki Kids Products are downloadable only and do not include hard copies.